MONDAY, JANUARY 15, 2018 DR. MARTIN LUTHER KING, JR. FREEDOM MARCH: Assemble: 1:30 pm Depart: 2:00 pm. Marchers will travel from the Romeo B. Garrett Cultural Center at Bradley University, 824 Duryea Place, to Mt. Zion Baptist Church, 305 S. Madison Park Terrace, Peoria. An MLK Commemorative Service & Awards Ceremony will follow. 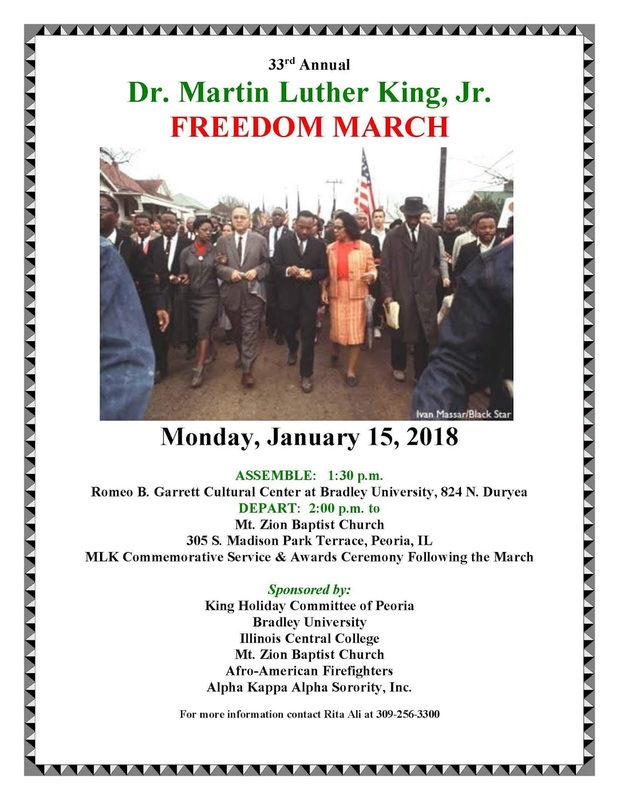 DR. MARTIN LUTHER KING, JR. COMMEMORATIVE SERVICE AND AWARDS CEREMONY: 2:30 PM – 3:30 PM following Freedom March. Event held at Mt. Zion Baptist Church, 305 S. Madison Park Terrace, Peoria. The inspirational speaker will be Rev. Craig Williams, Executive Director, Southside Mission. Rev. Williams has become a powerful soldier of ministry in Peoria fighting drugs, poverty, and hopelessness. MLK Leadership Awards will be presented following the keynote address. Join in on this wonderful community event and celebrate a National Role Model and Civil Rights Leader. Thank you, MLK.